Arsenal defender Laurent Koscielny is back in less intense training and it seems the French international will be returning sooner than expected. Arsenal defender Laurent Koscielny sustained an Achilles injury before the end of last season and he is up to now not yet available for selection because he is still battling with it but there’s hope that he will soon recover. 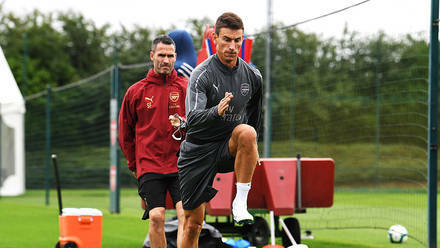 Laurent Koscielny who is Arsenal’s captain this season has begun light training as he hopes for a return in the coming months or even weeks since he seems to be getting better and better each day, Arsenal boss Unai Emery also recently said in a press conference that the gunners need to be patient with the Frenchman because his injury needs good handling. Arsenal fans are eager to see Laurent Koscielny back in action because their defence has been poor this season because the combination of Sokratis Papastathopoulos and Shokdran Mustafi isn’t working well but they believe that if the captain works with either of them, then they will be strong at the back. The gunners are currently in the nineth position on the Premier League table and will face Newcastle United this weekend, as per the progress of Laurent Koscielny in his recovery, the French international could be back as early as October even though the club had announced in the past that he would return in December.